Vilnius International Airport is a public airport owned by Lithuanian government and operated by Ministry of Transport and Communications of the Republic of Lithuania. Located at around 3.7 miles south of Vilnius, Vilnius International Airport was initiated in 1944. 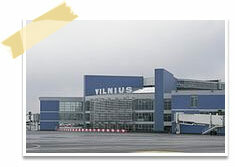 Vilnius International Airport handled around 1,373,859 passengers in 2010. Presently the main airlines operating at this airport are Wizz Air, Ryanair, Aer Lingus, Brussels Airlines, Estonian Air, Scandinavian Airlines, Lufthansa and Czech Airlines. Vilnius International Airport has a modern passenger terminal offering advanced facilities for the comfort of travelers. The facilities offered at this airport are cash dispensers, cafeterias, bars, VIP Lounge, duty free shops, tourist help desk, gift shops, business centre and special facilities for disabled travelers. Traveling to or from the airport can be easy and cost-effective by hiring a car with Lithuania Cars Rental. The capital city of Lithuania, Vilnius is a major economic centre of the country. Vilnius contributes around 25% to the Lithuania’s GDP. Situated on the bank of Neris River, this boasts many fascinating attractions which attract business and leisure travelers from all over the world. One of the most popular tourist destinations of this city is Vilnius Cathedral and its Bell Tower which stands on the central square of the Old City. This cathedral boats more than 40 paintings and frescoes. The old town of Vilnius is listed in the UNESCO World Heritage List and boasts beautiful Jewish buildings. Another must visit attraction of the city is Gediminas Castle which also contains a museum having artifacts reflecting the history of Lithuania and Vilnius. The other attractions of this city include St. Ann's Church, St. Peter's and Paul's Church, National Museum of Lithuania, Contemporary Art Center and European Park. Lithuania Cars Rental is one of the leading car hiring companies operating numerous rental locations all over the country. Lithuania Cars Rental offers an excellent collection of cars to choose from. The travelers can choose the cars that suit their budget and requirement. For a cost-effective and comfortable commuting in Lithuania, rent a car with Lithuania Cars Rental.